Two staples of the modern American diet remain risky bets amid ongoing federal safety investigations. 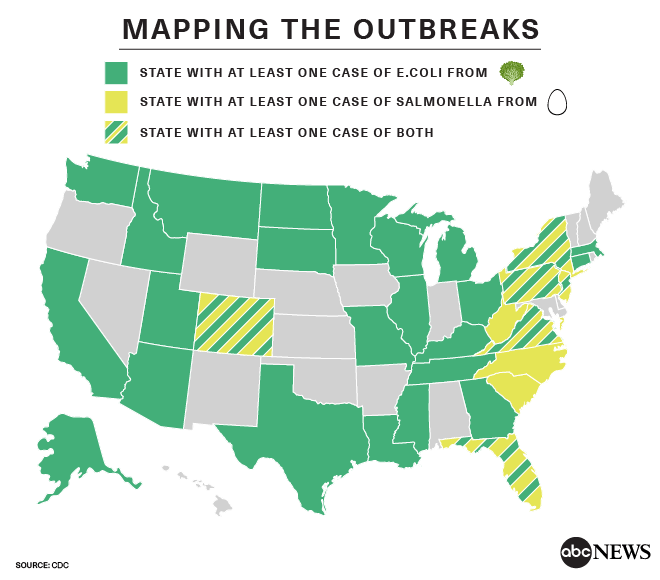 While a farm in North Carolina has been identified as the source of a salmonella outbreak that prompted the recall of millions of eggs in the U.S, investigators from the Center for Disease Control continue to hunt for the source of an E. Coli outbreak discovered in romaine lettuce. To date, 209 million eggs tied to the source farm have been recalled, but investigators cannot yet issue a similar recall for lettuce. So far, investigators have only been able to narrow down the source of the contaminated lettuce to the Yuma growing region in Arizona. "There are no barcodes on lettuce," she said. Officials traced the salmonella-tainted eggs to Rose Acre Farms' Hyde County farm in North Carolina. That farm sold eggs to multiple brands -- Publix, Food Lion, Country Daybreak, Coburn Farms, Nelms, Sunshine Farms, Glenview, Great Value, and Sunup’s. While there have been at least 149 reported cases of E. Coli nationwide connected to contaminated lettuce and 35 reported cases of salmonella nationwide connected to the recalled eggs, both situations remain fluid. Behm said that incidents of both salmonella and E. Coli poisoning are still being reported, and that the investigations will not be considered closed until there are no more reported cases. Updated numbers are expected to be released on Wednesday. The Food and Drug Administration, which has oversight over safety checks for both egg and lettuce producers, declined to comment specifically on the investigations because they are ongoing.